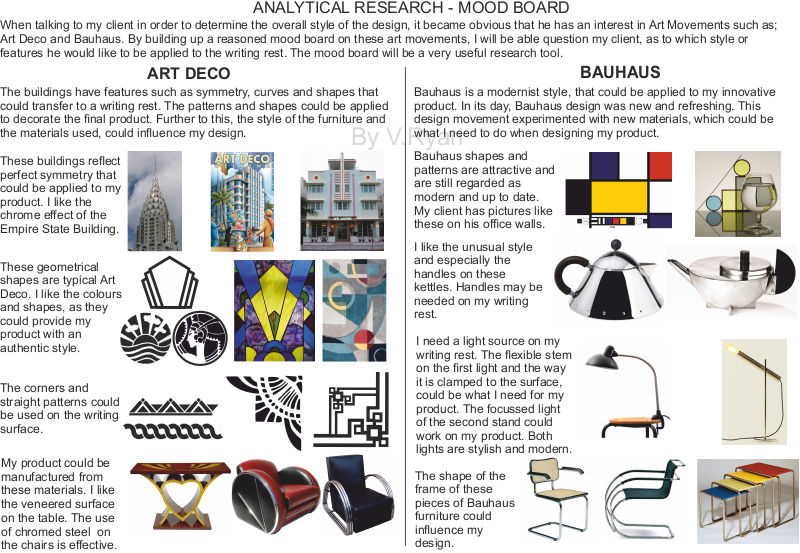 A mood board can be extremely useful as a research tool especially when working closely with a client / potential customer. For example, my client wants me to design a writing rest for an easy chair. When talking to him in order to determine the overall style of the design, it is obvious that he has an interest in art movements such as; Art Deco and Bauhaus. By building up a ‘reasoned’ mood board on these art movements, I will be able question my client as to which style or features he would like to be applied to the writing rest. The mood board will therefore be a very useful research tool. The mood board will not only be composed of pictures but also text that explains the reason for including the picture. The text will also explain which art movement features, are of interest and may be applied to the design. The buildings have features such as symmetry, curves and shapes that could transfer to a writing rest. The patterns and shapes could be applied to decorate the final product. Further to this, the style of the furniture and the materials used, could influence my design. These buildings reflect perfect symmetry that could be applied to my product. I like the chrome effect of the Empire State Building. These geometrical shapes are typical Art Deco. I like the colours and shapes, as they could provide my product with an authentic style. The corners and straight patterns could be used on the writing surface. My product could be manufactured from these materials. I like the veneered surface on the table. The use of chromed steel on the chairs is effective. Bauhaus is a modernist style, that could be applied to my innovative product. In its day, Bauhaus design was new and refreshing. This design movement experimented with new materials, which could be what I need to do when designing my product. Bauhaus shapes and patterns are attractive and are still regarded as modern and up to date. My client has pictures like these on his office walls. I like the unusual style and especially the handles on these kettles. Handles may be needed on my writing rest. I need a light source on my writing rest. 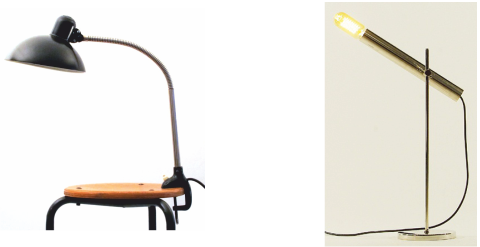 The flexible stem on the first light and the way it is clamped to the surface, could be what I need for my product. The focussed light of the second stand could work on my product. Both lights are stylish and modern. The shape of the frame of these pieces of Bauhaus furniture could influence my design.